Many people who say they are Christians think they are saved because their parents were Christians and raised them that way. There are those who think they are saved because an ancestor gave land or a building for a church building. Many choose where they worship by social standards; their family and friends "go there", or it's the place the rich and powerful of the community go. None of reasons describe a soul saved by the blood of Jesus Christ. Many in this world must pay a painful price to follow Jesus in truth and in spirit as we are commanded. Not all of us must choose between beloved family and being a faithful Christian, but this passage gives great comfort to those who sacrifice, pay the price, to follow Him fully in spirit and in truth and not just be a bench warmer and fool themselves into thinking that will reap eternity in heaven. This Christianity is not a small thing for Father God. It cost Him everything and He means what He says about it! He is not moved by man deciding to water His law down. His will will be done! 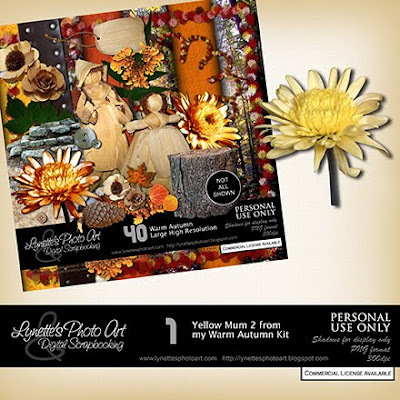 Today's gift is another gorgeous Mum from my Warm Autumn Kit. Another beautiful bloom, thank you! Thank you so much for this Freebie. 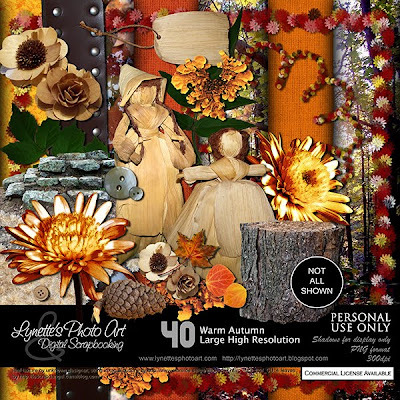 I want to let you know that I posted a link to your blog in CBH Digital Scrapbooking Freebies, under the Page 7 post on Oct. 27, 2009. Thanks again.